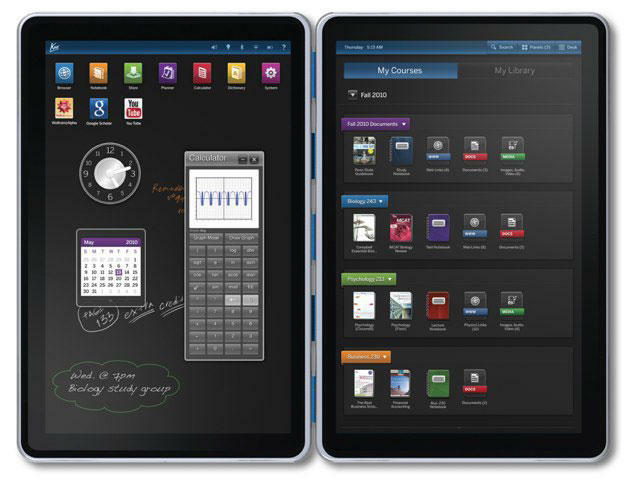 Is The Kno The Textbook Tablet We've Been Waiting For? Ever since e-readers first popped up in the world, people have been dreaming of the day they would replace those heavy, expensive textbooks that college students have to put up with. There have been test runs done with Amazon's Kindle that were less than successful, and the iPad test at Seton Hill University has yet to have any results announced, but the industry as a whole is moving forward with some new ideas that seem to address some of the shortcomings we've heard about other devices. As you can see from the video above, the Kno appears to really take on a lot of the complaints we've heard about e-readers in an academic setting. It's full-color for being able to see all the graphs and charts, you can take notes (we're presuming with your finger, which could get a bit tiresome), it plays videos and a heck of a lot more. It appears to truly replicate the textbook experience in a digital form. According to TechCrunch, the company has raised $55 million in funding thus far, and it hopes to have the tablets ready for release by the end of the year. Currently the only price confirmation has been "under $1,000", which might mean $999.99 for all we know. There has also yet to be any confirmation on how much text books will cost, but the company has been saying they will probably be under $100 each and that after 13 months you should come out ahead on your purchase. Considering that college is a minimum of a four year endeavor, that's not too bad. From the video you can see this thing is versatile, but if you also visit the site you will see students holding the device, and it's huge. While more real estate is a good thing, it could become a bit cumbersome for some situations, but still certainly better than lugging around 80 lbs. of books. Of course the biggest battle for the Kno is going to be with Apple's iPad. Reportedly text book companies are working on iPad specific apps that will allow you to take notes, watch videos and so on. Even with the most expensive iPad ringing in at $829 for the 64 GB 3G version, you're getting a device that will do a lot more than the Kno. The company is going to have to do a lot of things to set itself apart and appear superior to Apple's tablet, which it certainly looks like it may be for academic work, but they will still have to take on the marketing machine that is Apple. The key here will be getting entire schools to sign on to the device, and not just relying on individual students picking it up. If they can get schools to endorse the device, and possibly do bulk pricing for larger purchases, then they could be well on the road to success, but it is still too early to tell if those sorts of deals will be put in place. It is still early days in the overall war for textbook replacement devices, but it certainly looks like the Kno is on the right track to doing just that. What say you? Would you be willing to replace printed textbooks with the Kno?